We are currently TTC #2 and I am still nursing our 12 month old. I am just curious how nursing was during pregnancy. I nursed during both Dio's and Inga's pregnancies. I found that my milk supply dropped fairly drastically during the first trimester. By the second trimester it was almost nonexistent. Then the colostrum came around 7 months along. 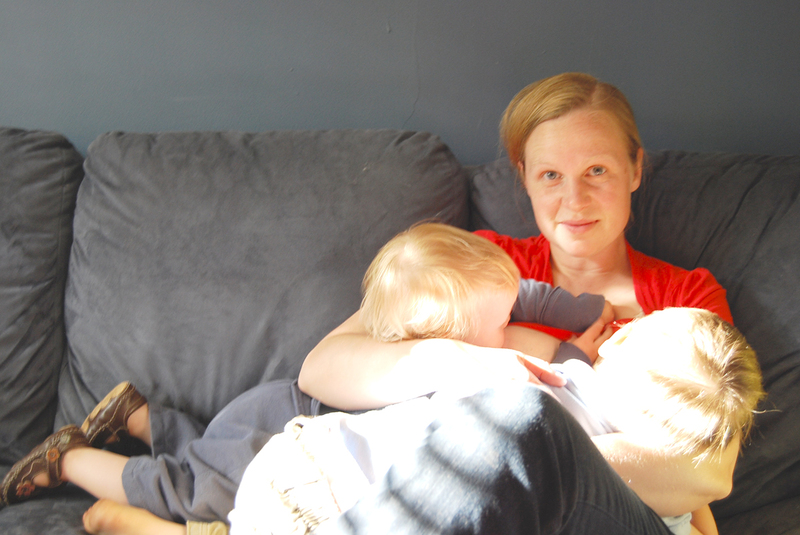 Nursing wasn't excruciating, but it wasn't quite as comfortable when I was pregnant. cute picture! I'm nursing my 2 year old and 8 months pregnant. I can't wait to tandem nurse! Gena, don't get me wrong, I don't do it too often! Now that Inga is quite a bit older, it's really fun to see the two of them play together when they nurse. Every time my toddler sees my newborn nursing, she wants to nurse, too. I usually ask her to wait until he's finished because it's harder for me to nurse him when she's nursing. But sometimes I give in and that usually ends with somebody crying...I'm sure we will work it out eventually.